One of the greatest gifts that Maria Montessori gave us is the understanding that children flourish best when surrounded by an environment that is designed uniquely for their size and stage of development. 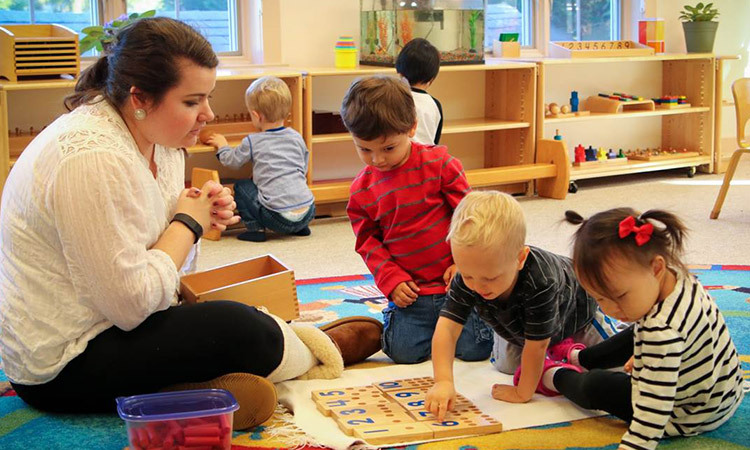 A well-designed Montessori classroom offers a safe, comforting, stimulating space that invites your child to discover the world, learn to care for themselves and others, and develop a way of thinking that gives them an edge in life for years to come. The best Montessori learning environments share several elements in common that make it easy for caring parents to identify schools where their children will enjoy an authentic, life-changing Montessori education. These 7 vital essentials are part of any superior, genuine Montessori classroom—including the classrooms at Primary Montessori Day School. You might be surprised to discover that not all classrooms are equally designed to be child-friendly. In a Montessori classroom, the design aspect is especially important because children of different ages and sizes will be learning in the same space. Your child deserves a full, enriching, satisfying education that develops every part of their being—academically, physically, emotionally, and socially. And an authentic, loving Montessori classroom provides all of this and more for your son or daughter. At Primary Montessori Day School, we equip children with the skills and passion for learning that will give them success for a lifetime. And we’re always happy to share with parents what we do, how we do it, and how your child can benefit from a Montessori education. Our programs offer a positive, fulfilling Montessori learning environment that children and parents both love. And when you’re ready to see for yourself what your child will enjoy at our school, we invite you to schedule a tour of our Montessori classrooms. We look forward to connecting with you and showing you the powerful impact of a Montessori learning environment on your child’s long-term success.